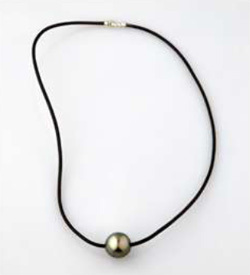 Enter to win a black peacock Tahitian pearl necklace worth $550! Sometimes it only takes a simple necklace to add class and sophistication to an outfit . Enter our Tahitian Pearl Necklace giveaway for a chance to win our favorite new statement necklace : a black peacock Tahitian pearl piece worth $550! With a single pearl delicately hanging from a sleek black leather cord , this necklace is a great addition to any outfit and perfect for every occasion . Contest ends Feb 12. One entry per day allowed.